리우데자네이루 코파카바나 / 레미에 위치한 Oceano Copacabana Hotel은 최고의 즐거움과 편안함을 누릴 수 있는 가장 이상적인 곳 입니다. 이곳에서 생생한 도시의 모든것을 쉽게 즐기실 수 있습니다. 지역의 관광 명소와 경치를 구경하고, 호텔에서 멀지 않은 코파카바나 비치, 카사 드 단카 칼린호스 드 지저스, 펀다카오 에바 클라빈 라파포트에서 즐거운 시간을 보낼 수 있습니다. 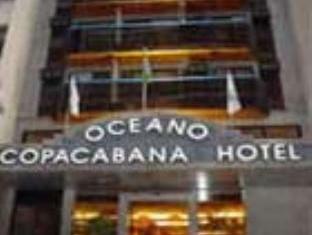 Oceano Copacabana Hotel의 모든 노력이 손님의 기분을 편한하게 만들기 위해 호텔은 최고의 서비스와 시설을 제공합니다. 24시간 프런트 데스크, 여행 가방 보관, 룸 서비스, 회의시설, 신문 같은 최상급의 시설을 호텔에서 즐기실 수 있습니다. 또한, 모든 객실은 편안하고 안락하게 꾸며져 있습니다. 대부분의 객실에서는 고객님의 편안함을 더하기 위해 에어컨, 미니 바, 발코니/테라스, 전화기, TV 등의 편의 시설을 제공해 드립니다. 운동을 좋아하는 사람이나 힘든날을 뒤로하고 피로를 풀러 방문하는 모든 고객들에게 최상급의 온수욕조, 사우나, 실외 수영장 같은 레크레이션 시설을 사용하실 수 있습니다. 이상적인 위치와 시설이 잘 어우러진 Oceano Copacabana Hotel 숙박시설은 다양한 옵션을 마주 할 수 있는 곳입니다. The hotel does not accommodate more than 3 people in a room, regardless of the guests' ages. Please note that the credit card used for reservation must belong to the guest who will be staying at the hotel. Early check-in or late check-out incur the charge of an additional daily rate. Guests can leave their luggage at the hotel if they arrive before check-in regular hours. According to the Brazilian Federal Law 8.069/1990, minors under 18 years of age cannot check into hotels unless they are accompanied by their parents or a designated adult. If a minor is accompanied by an adult other than his parents, it is necessary to present a written authorisation for the minor to check into the hotel. Such authorisation must be notarised and signed by both parents, and presented along with notarised copies of their IDs. All minors under 18 years of age also need to present a valid ID with photo, to prove their identity and that of his/her parents. This must be presented even if a minor is accompanied by his/her parents. In the case of a minor accompanied by only one of the parents, it is necessary to present a notarised authorisation signed by the absent parent, along with a notarised copy of that parent´s ID. We stayed here for one night. Our bathroom door was broken with nails sticking out if it. The jacuzzi was filled with brown water and not working. The pool was way smaller than it seemed in the photos. However, it was a nice enough place for one night. The hotel definitely photographs better than how it appears in person. I think the hotel needs quite a bit of updating so that it doesn't look and feel so antiquated. Our room wasn't spacious and the decor is quite cheesy. Other than that, the staff was helpful and knowledgeable. This hotel is terrible. It was completely dirty. Our room smelled like urine. It wasn't cleaned when we checked in. they made the bed and gave us the keys. Didn't even change the sheets. We had to ask them for new sheets. There was an extra bed leaning on the wall when we walked in, the glass shower door was broken so they put a torn shower curtain in its place. It had been that way for some time as the hooks on the curtain had rust! I wouldn't recommend this hotel to anyone. Too expensive for a hostel and that is exactly what you are paying for. 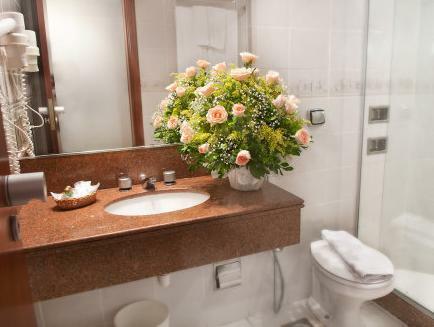 It is a nice Hotel in Copacabana, ome features in the rooms need renovation, but generally iot is clean. Good breakfast, and a nice view from the roof top swimming pool. It is a nice hotel for the money you pay. Some rooms need renovation, but overall it is clean and very well located. Buffet breakfast was very good. 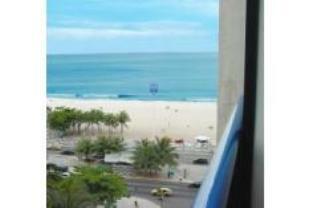 this hotel has an excellent location just on copacabana. the roof-top terrace and pool is also really nice, rooms were clean and ok! The service performed by the day receptionist was terrible. An older man with good English skills. He totally lacked politeness and positive attitude, acted as people coming to check in were just a bother to him. I have stayed at this hotel a few times. I generally use it for a few days to recover from flights andto get used to being in brasil again. The staff are friendly and helpful, and the hotel itself is good for the price. I would recommend this to anyone. This hotel is getting a very bad rap on one website Those complaining must be cranks or have made excessive demands. I found the staff to be most friendly, helpful and knowledgeable s well as being very competent speakers of English. The breakfast room is cramped but the offerings plentiful. The location, 1/2 mile from the beach is excellent. The management acted very greedily in permitting me to stay five extra hours in my room after a 9-night stay at the "very special rate" of a 1/2 day price. But I have no quibble with the staff. They were very polite and friendly. when i arrived at the hotel there was a "GREAT PROBLEM" i made reservation with my dad's credit card. this was a problem becourse they insited that i showed the the credit card from the reservation. after he stressed me for over an hour and half (and 20 phone calls to holland and bangkok)he gave the apartment free. all kinds of regulations where aplyed to me....do this, and if you dont do that...than i will bla bla bla the receptionist drove me crazy! (i was willing to rent a hitman for him!!) Then the room...... the bed looked like a bowl, the radio didn't work the lights where broke(2 of them)and in the corners of the room and bathroom was a lot of dirt. I had a room at the back of the hotel, and there where like 120 aircond. that keep you a wake! Then the poor breakfast, everyday the same! and you have to wait in line to get a table in the tiny restaurant! So i have only 1 question... the 4 stars that the hotel has, did they buy them at the local supermarket??? Cheap price in an expensive place. No sea view. Breakfast weak. The hotel is located just inside the lane and you cannot appreciate the beach. The hotel staff is ok and if you talk to them properly, then maybe they won't rip you off on the tours and sightseeing trips they provide. The breakfast is weak with only a few dishes and always the same. two single beds given, even when i had asked for a double bed. Location is walkable destance from the Beach. Very slow Internet, No office assistance, Single recepitionist taking long time to handle people. Excellent location (few meters from the Copacabana beach and good restaurants), wonderful view from the window of the room. They provide parasol and towels to go to the beach. The staff is not kind, but they do their work. They usually pushed me to use taxi when I just wanted to get an ordinary bus, giving me wrong information about buses. You have to pay for the safety box. Even though the staff was not that good, the manager randomly chose me to get probably the best room of the hotel with a wonderful view of the Copacabana beach. The swimming pool was very small, but I already expected that. The breakfast was good. I felt very safety around the hotel, there are good restaurants near there, also a supermarket 300m from the hotel. Beach Close, Friendly staff as allways. Room is more than satisfactory. Air conditioning switches off when you leave the room, so can be a little hot when you arrive. This is My fiancee and I's third stay at this hotel. We use it as a nice place to relax when I arrive after a long flight. We have enjoyed our stay every time. It is good value for the money and has plenty of things to do nearby and it can help you to find good value tours as well. The staff are very friendly and over all we will continue to use this hotel for each visit.
. Rude staff. Gloomy rooms. Aggressive manager. Depressing, smelly appalling condition on coridors. When we arrived we waited for 1 hour and 20 minutes to check in even though it was 15.30 (well after check in time) and we were told that we´d be waiting 5 minutes. We had just had a long journey there so we would have liked to a glass of water or something while we waited. We were told that if we didn´t like waiting that the hotel was full so that we could book in elsewhere. It was 3 days before Christmas, so it was quite unlikely that we´d have been able to find another hotel. When we got up to the room it was very smelly. It was dark, gloomy and with a view of run down apartments. The breakfast was ok. However on Christmas Day we arrived down at 10.10 in the morning. The staff had already cleared breakfast and there was a sign on the door to say breakfast finished at 10.00. The information in our room stated that it finished at 10.30. The manager shouted at us and said that it did not say that breakfast finished at 10.30. We asked him to accompany us to the room, but he wouldn´t and said that he would let us have some breakfast. He gave us dried/hard bread and not much else. We felt very bad because we felt that the other staff were working when they should have been finished on Christmas morning, but we weren´t sure if anywhere else would be open for breakfast. We got wet glasses (and we had been told not to drink the water in Rio, so we weren´t happy about that). The girls at reception barely looked at us when they dealt with us. I would not recommend this hotel to anybody. It has four stars too many. The service was appalling. We would have left on day 1 excpet it was the holiday season. We had friends staying in nicer hotels for the same price.